Young Brooklyn musician Max (Sean Bones) decides to go on a Caribbean cruise alone when girlfriend Willow (Norah Jones) dumps him two days before the trip. Once in Jamaica, Max eschews the tourist zone for more “authentic” surroundings. In the process, he is robbed of his possessions and stranded - literally missing the boat. 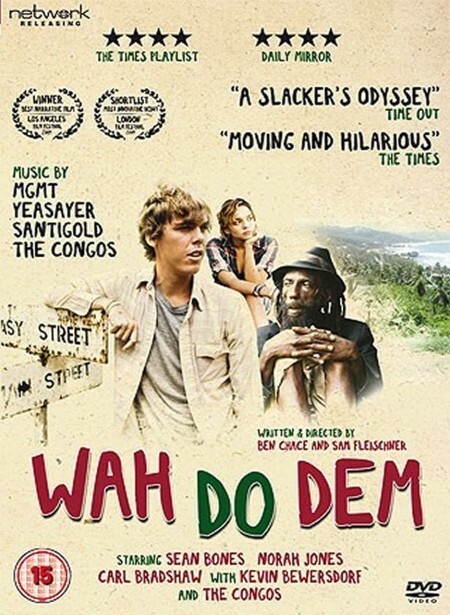 As Max sets out for the American Embassy in Kingston on foot, Jamaica is waiting to meet him with unexpected and extraordinary encounters, including a full-moon celebration with legendary reggae collective The Congos, and a dreamy stay with a Rasta prophet (Carl Bradshaw – The Harder They Come). Ben Chace and Sam Fleischner’s Wah Do Dem (Jamaican Patois for “what’s wrong with them?”) began life in unusual circumstances. When Ben won a cruise in a raffl e at a free screening of Buster Keaton’s The General in Brooklyn, he invited Sam to come along, and the young fi lmmakers’ trip turned into a project; additional tickets were bought for actor/musician Sean Bones and sound recordist/actor Kevin Bewersdorf, and the crew of four set off for Jamaica. Once there, they were joined by producer Katina Hubbard and, with a shared love of Jamaican culture, began mapping out the story’s possible scenarios. The result is an original, funny and vibrant fi lm, with a touching and comical lead performance from Sean Bones. It also features Norah Jones, Carl Bradshaw and Kevin Bewersdorf, with music and performances by MGMT, Yeasayer, Santigold, Suckers, Mykal Rose, Mr. Lexx, The Congos, and more.